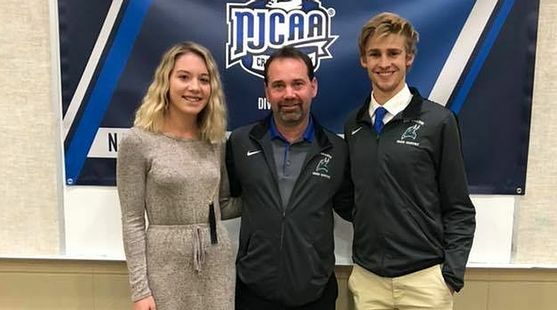 ESCANABA---Two Norse Cross Country team members are poised to make history as the first ever student-athletes from Bay College to compete in an NJCAA National Championship. Zoie Berg (SO, Gladstone, MI) and James Young (FR, Gladstone, MI) will compete in Garden City, KS on Saturday. Berg was voted as the "Most Improved Female Runner" for the 2017 season, and has come back strong in 2018. She has been the top runner for her team in every event. Only two of the events that the Bay women have competed in this season have matched the 5K length that the National Meet is slated for. Berg ran her best 5K time at home on September 22, finishing third in the Bay College Quality Inn & Suites Invite with a time of 21:02.3. More recently she competed in the U.P. Championships hosted by Northern Michigan on October 19. Battling an ankle injury, Zoie posted a slightly slower time, finishing that race at 21:12.1. "I think my season has gone well," said Berg while reflecting on her fall. "I've made a big improvement from last year. I completed my goals of running in the 25's [minutes] in the 6K races, and in the 20's for a 5K." Berg seems to be over the injury that limited her in the last race. "I took a week off and went to the trainer every time that I could," said the sophomore. "I ran the Harvest Moon 5K on Friday and I didn't have any pain at all." Zoie went on to talk about the challenges of the sport, and how she found support in many places. "Cross country is different from any sport I've ever done. Everyone is so kind and encouraging. You can be at the point where you're falling back or feel like you want to drop out and there is always someone right there telling you to keep going." In his first season with the Norse, Young has been consistently the top runner for Bay. He only missed out on that honor twice this season, one of those times being because he withdrew due to an injury. His best finish also came at the home meet. James would be the eighth runner to cross the line that day, posting a time of 30:29.4. In the five races he has run this year, all 8K lengths, Young has averaged a time of 31:32. "I thought my season went pretty well," said Young. "I had an overall goal of getting my time under 30 minutes, and I feel as though I would have done it, but my late season injury and getting sick set me back. Overall it was a lot of fun and I made a lot of great memories." Young went on to talk about what he is looking forward to as the big event approaches. "I am really looking forward to the overall experience. This is really a big deal, this is the National Championship, and I am honored to represent Bay College. I am looking forward to getting a sense of the atmosphere, and really want to see how I can compete against the other teams and individuals. It will be great to measure where I am, and how much work I have left to do going forward." "I am super excited for Nationals," added Berg. "I am so thankful that James and I get to compete and represent Bay College. It is a once in a lifetime opportunity that I know I'll never forget. My goals are to run my personal best and have fun. There are going to be a lot of talented athletes there and I'm excited to compete against them." "This is an exciting time and a big deal for the Bay College Cross Country program," said Head Coach Jim Murtha. "Both Zoie and James have put the time and effort in to get where they are. They will represent Bay College well at Nationals." The NJCAA Division 1 Cross Country National Championship will be held on November 10 at Buffalo Dunes Golf Course in Garden City, Kansas. The women's five kilometer race will begin at 12 p.m., while the men's eight kilometer race will start at 1 p.m.